The Black & Decker BM3B is a very practical battery charger and maintainer. It can be used to charge all kinds of vehicle batteries such as RVs, specialty vehicles, motorcycles, marine deep cycle batteries, lawn mowers and watercrafts. It is also used for maintaining battery charge in stored vehicles and comes with a set of connectors and terminals which makes it adaptable to a wide variety of batteries. This battery charger comes with a pair of charging clamps, O-rings and a DC connector which gives a wide set of options for charging or maintaining the battery. The charger can also be switched between 6V and 12V according to the requirement. This is the best part of this charger as you will not have to worry about the connectors you need, and it can easily get connected to various kinds of ports you have with your battery that needs to be maintained. Also the variable mode between the two voltages can be easily adjusted and you can charge and maintain the battery no matter if its of a larger vehicle or a small one having different voltages and capacities having 6V or 12V. The Black & Decker charger is based on Smart charging technology and retains the battery charge to an optimal level while the 1.5 amp High Frequency charging feature will quickly charge your batteries and automatically switch to float mode once the battery charging is full. You will not have to care much about how it will do this and your battery would be easily and efficiently maintained with this automated preset way. This charger has a special protection seal against dirt, moisture and oil. It comes with a mounting bracket to keep it in a safe position while charging. After mounting it on your battery safely you can forget about it and let it work without any issues. There will be no hazards or interruptions caused due to slight shocks, dusty air and all such environmental conditions. 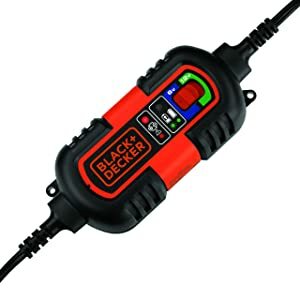 The overall performance of this Black & Decker BM3B charger is really good and efficient and it can solve a lot of vehicle charging issues with just one charger. Just be careful, if you have a dead lead acid battery you may not be able to give it a start because it has a low trickle charge and would only be suitable to maintain the batteries. Otherwise, if we see its maintaining facility, you would be disappointed and can rely on the battery tender for sure. You will only have to mount and connect this battery tender to the battery that needs to be maintained and you can stay worry free about it maintenance and this small gadget would do its part actively.